This adorable character Activity Doofy Dog is a wonderful way of keeping your baby entertained while developing learning skills. The soft dog teaches baby about hand-eye co-ordination while encouraging tactile and sensory development using sounds, shapes and textures. 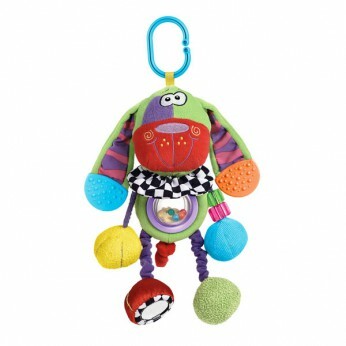 The perfect activity toy to captivate and entertain baby. Features: Easily attaches to most prams and strollers. Teethers, rattle, squeaker, crinkle fabric and mirror. Great for developing motor skills and hand eye co-ordination…. This toy costs approximately £7.99 (for the latest and best prices make sure you check our retailer list for the Playgro Zany Zoo Activity Doofy Dog above). In our review of Playgro Zany Zoo Activity Doofy Dog we classed it as being suitable for ages 0 to 11 months but recommend you check the manufacturer specific advice before purchasing.